Beach BBQs are fun, with great food and ambiance. Beach bonfire gathering at Long Bay on Providenciales. One Turks and Caicos evening activity that’s popular with visitors and locals alike are beach bonfires and BBQs. These events are a great way to experience the sunset, and offer a unique and laid-back atmosphere. 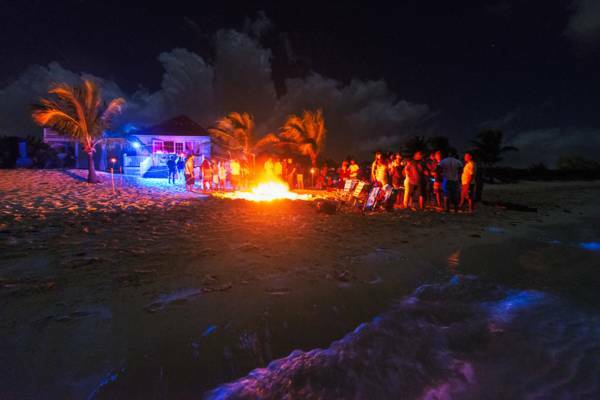 Seven Stars resort and Somerset resort both offer weekly beach bonfire events. The Seven Stars BBQ features live music, and the Somerset event has a DJ. The scheduled beach BBQs hosted by the resorts and restaurants tend to feature buffet-style dining, with a bar set up on the beach that offers rum punch, cocktails, and other drinks. The culinary experience of the BBQs vary greatly. 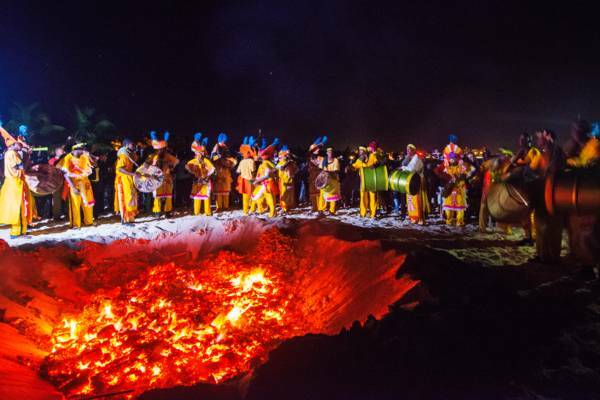 The fare offered by the resorts is typically a great buffet selection with surf and turf options, and the more informal events often have seafood, traditional BBQ, and soups and stews cooked on the fire. The resort and restaurant hosted events will usually have ample seating and tables set up for guests on the beach, in addition to the typical beach and pool loungers. Bay Bistro restaurant, located at the boutique Sibonné resort, also hosts a full moon beach pig roast BBQ every month, which is a great event. The New Year's Eve bonfire at Ricky's Restaurant on Grace Bay. For many the bonfires and gathering is interesting enough, yet there are often additional aspects of entertainment to look forward to. The events hosted by the resorts typically have either live music, or a DJ, so dancing under the stars is usually a possibility. Fire dancers are another potential sight. Some of the larger bonfire gatherings, such as the one hosted by Ricky’s Café on New Year’s Eve, also have Junkanoo bands performing. Largely only seen on the sheltered south coast beaches, glow worms are another fascinating sight, and for a few days surrounding the full moon, these tiny creatures exhibit flashes of light that can cause patches of water to glow. It’s undeniable that the pristine beaches in the Turks and Caicos are a spectacular setting for watching the sunset, and a bonfire is the perfect excuse to be on the beach! Every beach offers its own character. Grace Bay Beach has an expansive and panoramic vista, and the smaller and more-sheltered coasts tend to have a bit more reflection on the water. The elusive green flash is another sight to watch for. This uncommon atmospheric phenomenon can be observed occasionally, most often during calm wind and water conditions. As the name suggests, this event is typically seen as a brilliant green flash.